If you’re expanding or building a new facility and think that maximizing storage density in every possible way will give you the biggest bang for your buck, you need to think again! One of the most common design flaws I see is shallow docks. Usually, a shortage in fronts or storage capacity drives the need for more space. But if that extra capacity comes at the expense of dock space, it can end up being more costly than you’d expect. A recent example was when I consulted for a boxed meat wholesaler that ships 30,000 cases a week through a 32’ deep dock equipped with 5 doors. A real nightmare for this very high turn business. The previous owner was heavily involved in the design of the facility and wanted to make sure there was enough space to handle opportunistic buys in a highly volatile beef market. Fair enough. But he did so at the expense of dock space in order to stay within budget. The new operator is now doing an amazing job of growing sales but this came with severe operating penalties due to significant dock congestion. Not only did this incur additional costs, but the risk of not getting orders out the door was a real threat to service levels. When we evaluated a range of alternatives for this client, immediate expansion was out of the question and extending the dock internally was not a viable option due to capacity constraints. So we transferred the meat processing operation to another facility (their foodservice meat division), which enable them to convert an entire room into an order staging area. They were then able to remove rack bays on the dock that had been installed for that same order staging purpose. While not ideal, these changes freed up the dock and alleviated the gridlock pain that was hampering their operations. What is the ideal dock depth? If specific requirements warrant additional space (e.g. reverse line picking), incorporate it. 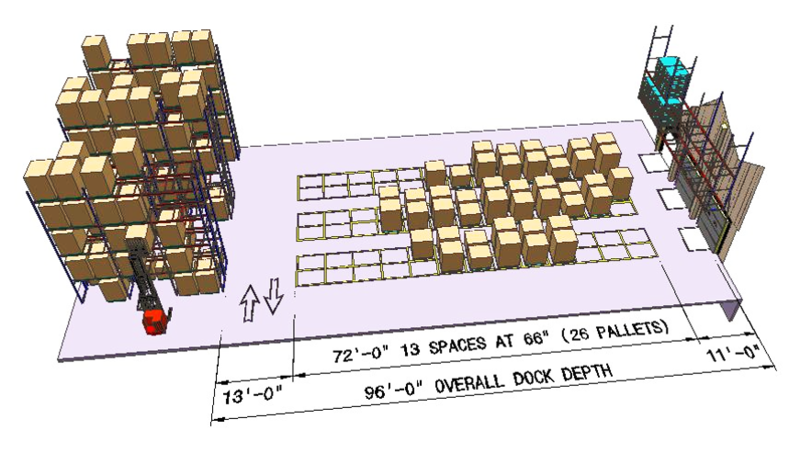 It is now common practice to design for an 80' to 100' deep dock in high volume environments such as food distribution. In ambient storage, you can address this problem relatively easily by removing rack bays – given that capacity is not an issue. This might expose columns so make sure this constraint is integrated into the design and have adequate safety measures in place to ensure those columns are visible to traffic. For refrigerated space, where walls might separate the dock from storage areas, extending the depth of your dock might be more difficult and costly. This becomes a feasibility and cost/benefit analysis. What about all that empty space above your dock? If you’re designing a new facility, office space represents the obvious choice. Otherwise, you can store empty pallets in racks hanging from the ceiling. And if these options don't suit you, then there is plenty of room to store the boss’ winter tires! 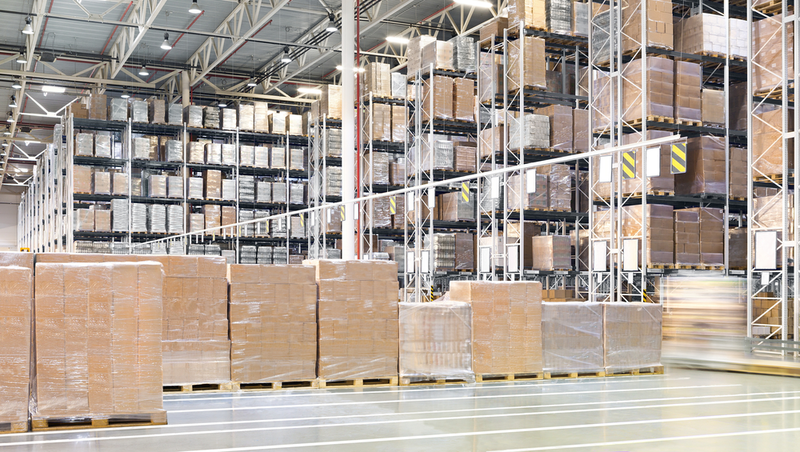 Does your facility lack enough dock space? What workarounds have you put in place to deal with it? Drop me a comment below, I’d love to hear your ideas. 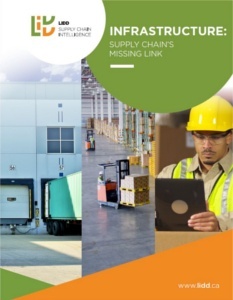 If this topic interests you then you should check out this post on Door Design and Trailer Interaction as well as our Guide to Product Slotting in the Distribution Center, which addresses the three critical considerations that can derail your slotting, along with a proven methodology you can use to ensure successful slotting projects.